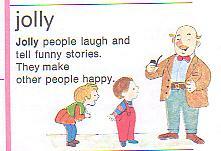 Jolly people laugh and tell funny stories. They make other people happy. "Let's go swimming," said Skipper. "Let's go out in one of those boats," said Barbie. "Let's do both," said Ken.